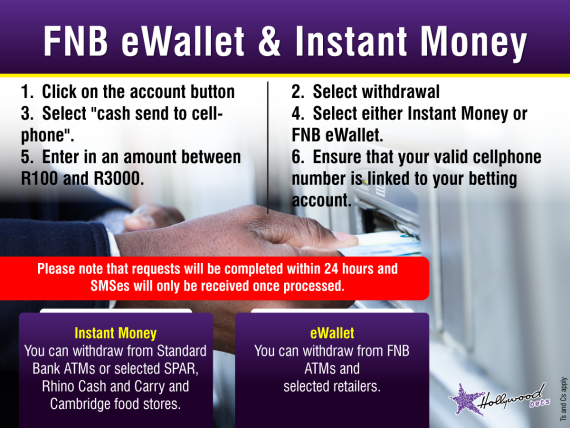 You can now withdraw from your Hollywoodbets account using eWallet and Instant Money! Select "cash send to cellphone". Select either Instant Money or FNB eWallet. Enter an amount between R100 and R3000. 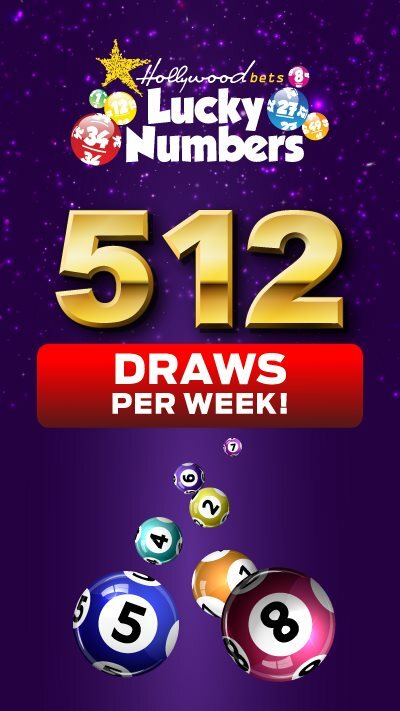 Ensure that your valid cellphone number is linked to your betting account. eWallet allows you to withdraw from FNB ATMs and selected retailers. Instant Money allows you to withdraw from Standard Bank ATMs or seleceted SPAR, Rhino Cash and Carry as well as Cambridge Food stores. Withdrawals via Instant Money or FNB eWallet are subject to a minimum withdrawal request of R100 per withdrawal. Withdrawals via Instant Money or FNB eWallet are subject to maximum daily and monthly pay-out limits. A daily pay-out limit of R3 000 applies and a monthly pay-out limit of R25 000 applies. Multiple withdrawal requests may be consolidated and paid in one lump sum, but subject to the withdrawal limits noted above. 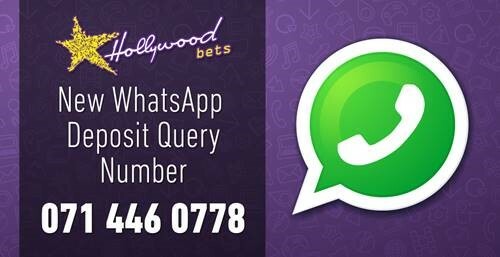 Withdrawals will be paid out to the valid South African cell phone number linked to the active Hollywoodbets account. Changes to cell phone numbers, referred to in point 4, prior to withdrawals will be subject to verification checks. Withdrawals will be made to the account holder only and not to any third party in any circumstance. The customer’s right to settlement or payment is not transferable or negotiable. Withdrawals of cash can ONLY be made at the stipulated ATM’s and retailers providing the Instant Money and FNB eWallet services. Withdrawals will be processed within 24 hours of request but are subject to banking hours. Once payment has been effected, the funds cannot be reversed into the Hollywoodbets account or paid again via an alternative withdrawal method. 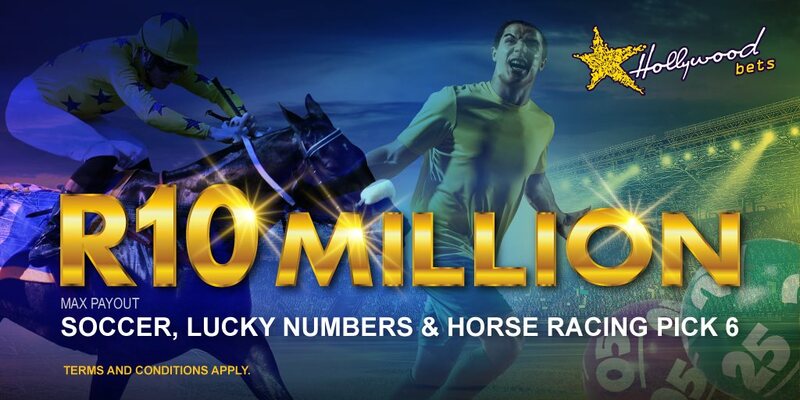 Hollywoodbets relies solely on the banking systems of Instant Money and FNB eWallet to effect withdrawals into customers’ cell phone numbers. Therefore, Hollywoodbets accepts no liability should the service be made unavailable and/or for withdrawals/SMS’s being delayed for any reason whatsoever. With Instant Money, once the withdrawal is made, the client will receive an SMS with a voucher number followed by an SMS with a pin. There is usually a 5-minute delay between SMS’s. With FNB eWallet, the client will receive an SMS from FNB and will be required to dial the specified code to obtain the pin required for the withdrawal. Should funds be paid to your cell phone number in error, it is your responsibility to immediately notify Hollywoodbets of the deposit. 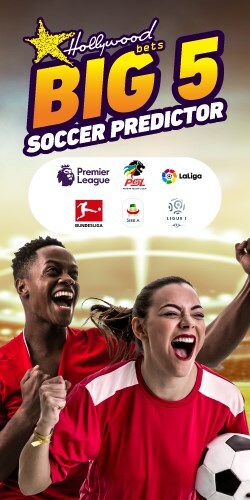 Any amount paid to you as a result of the error and prior to the notification of Hollywoodbets, whether linked to the error or not, shall be deemed to be invalid and will be repayable by you to Hollywoodbets and you are deemed to agree and accordingly hereby authorize Hollywoodbets to deduct from your account the sum incorrectly paid into your account. 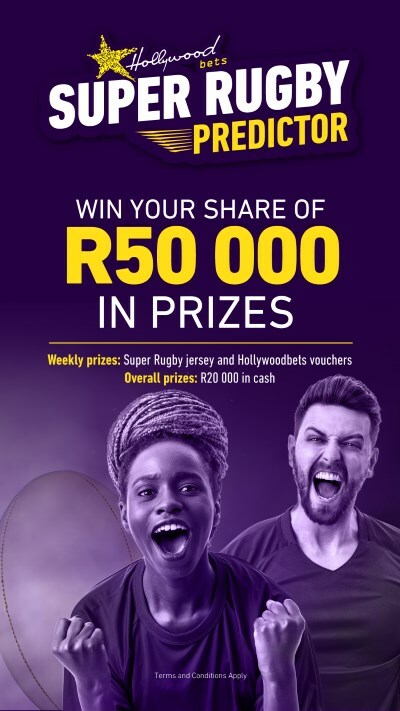 Hollywoodbets reserves the right to cancel or withdraw this pay-out method or change any of its terms and conditions at any time and without cause or notice. Hollywoodbets reserves the right to request FICA documentation, for whatever reason, from any customer prior to the withdrawal being paid out. 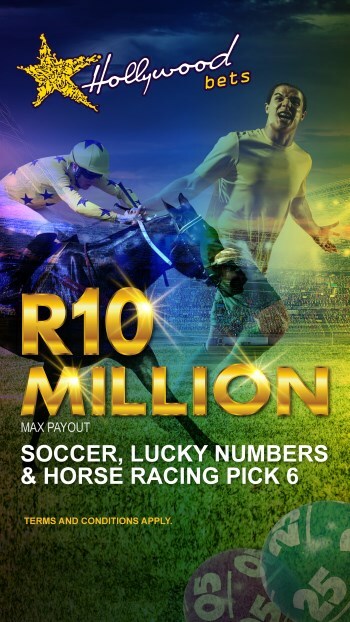 If clients are unsure of how to utilise this withdrawal method, they can contact the deposit department at deposit@hollywoodbets.net or on 087 353 7634. Hollywoodbets reserves the right to reject any withdrawal request should irregular activities be noted.